Although beautiful in its own right, Wat Traimit is more famous for its Buddha image which resides inside in the top tier of this modern temple building. 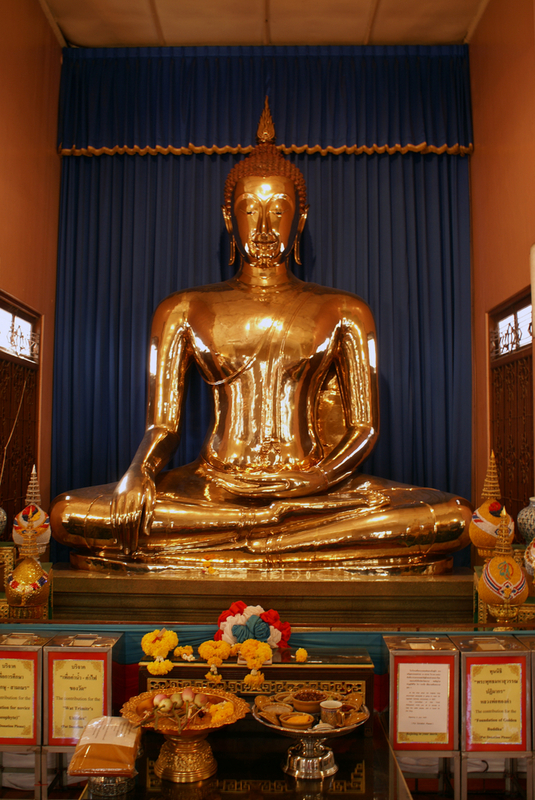 The Buddha image is reportedly made from solid gold and is the biggest solid gold Buddha image in the world. Not a great deal is know about the detailed history of this Buddha image but it is thought that it was cast around the 13-14th Century in the period of the Sukhothai Kingdom and was moved to Siam’s new capital of Ayutthaya around 1403. At some point in Ayutthaya the Buddha was covered in a plaster stucco inlaid with decorative glass, this was probably a means to disguise the image of its true material from thieves, looters and marauding Burmese armies. It must have worked as the image remained in Ayutthaya (not attracting much attention) until is was moved to Bangkok when King Rama 1 ordered the remnants of many of Ayutthaya old Buddha images to be moved to the kingdoms new capital at Bangkok. At this time the Buddha image was still covered in its stucco outer layer and was installed as the principle Buddha image at Wat Chotanaram in Bangkok. When Wat Chotanaram fell into disrepair it was then moved to its current temple, Wat Traimit , at this time no one knew of the image’s importance and underlying material. It wasn’t until the image was being moved to a new wihan in the temple grounds that some of the stucco was chipped revealing the gold Buddha underneath. In 2010 the Buddha image was rehoused in its current building. 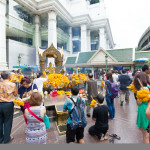 As the temple is situated on the edge of Bangkok’s vibrant and busy China Town district the temple also houses a Museum covering the history of Bangkok’s Chinese community. An entrance fee of 40 Baht is charged for adults, there is an additional fee of 100 baht if you want to visit the Chinese history museum. Wat Traimit is situated on the edge of the Chinatown district of Bangkok. You can take a tuk tuk or metered taxi but there are other available public transport options worth considering. The Hualumphong MRT underground station is only a short 4-5 minute walk away and the Marine Department boat pier for the Chao Phraya River Express boat service is only a 5minute walk in the other direction. 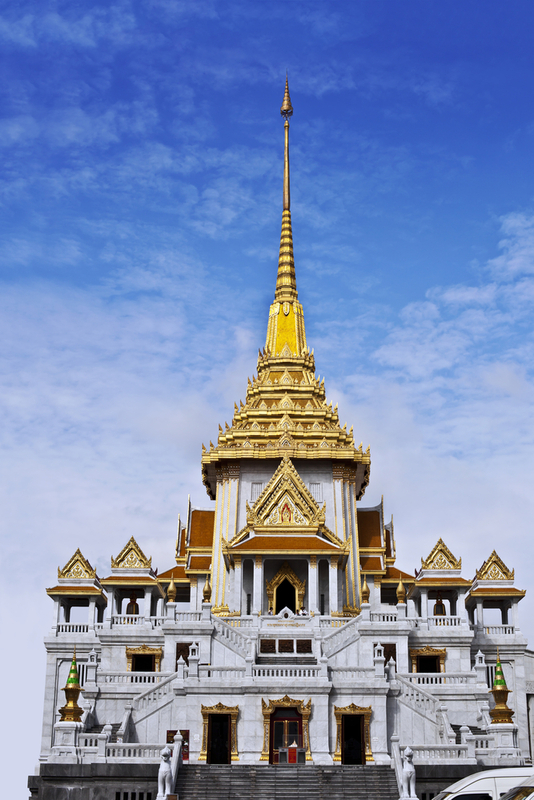 Wat Traimit is situated only a short 4-5 minute walk from Bangkok’s main Hualumphong Train Station. If you are waiting for a train and got an hour or so to kill then then is the perfect way! 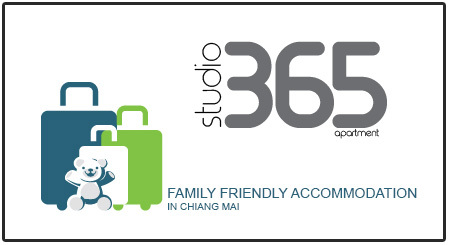 There is a left luggage service at Hua Lumphong Train Station! 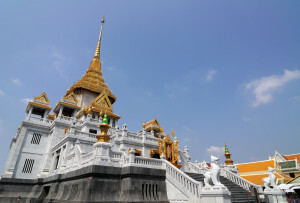 If you want to visit Wat Traimit with Travel Hub then you can see it on the “Bangkok Half Day City Temples Tour” as well as the “Full Day Grand Palace, Temples, Canals and China Town Tour“. 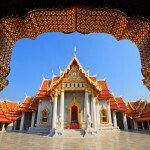 Grand Palace Scams – Be Aware!